San Francisco, USA -- Recent events give added immediacy to several objects in "The Kingdom of Siam: the Art of Central Thailand, 1350-1800" at the Asian Art Museum. A 16th century copper Buddha stands with both hands raised waist high, palms forward, in a symbolic gesture or mudra known as "restraining the ocean. " It evokes the legend that the Buddha Shakyamuni once turned back encroaching flood waters by spiritual force alone. Alas, no such gesture, or anything else, availed against the tsunami that hit South Asia in December, claiming an estimated 8,000 lives in Thailand. That knowledge may enable us who felt none of the tsunami's direct effects to connect with this show of relics -- the first of its kind -- from a distant and long-gone culture. In the 18th century a wave of events overtook the kingdom of Ayutthaya, known in the West as Siam until its 1939 name change to Thailand. Invasion by Burma and subsequent famine, epidemics and crises of leadership vanquished the culture of Ayutthaya after more than 400 years of comparative stability. Apart from records of the royal court in the 18th century, the evidence of trade with neighbors and Europe and impressive architectural ruins, artifacts such as those on view at the Asian Art Museum make up the sole remnants of the civilization centered on Ayutthaya. The culture's remains leave the impression that Buddhism pervaded it at every social and material level. The objects on display include massive fragments of architecture and monuments, among them a ponderous, timeworn bronze Buddha head, that suggest an immense commitment of resources to belief as a force of social cohesion. The museum has installed the big, damaged Buddha head on a high pedestal in its atrium to suggest the scale of the body to which it belonged and the effect of looking up at it. Theravada Buddhism predominated in the Ayutthaya realm, a strain that emphasizes emulation of the historical Buddha and dwells on the details of his life. Or rather, lives. As exemplar, the thinking goes, Buddha Shakyamuni -- the historical Buddha -- reached enlightenment only after accumulating wisdom and virtue through many rounds of life, death and rebirth. The adherent of Theravada Buddhism seeks deliverance from suffering by the same path, viewing as givens the cycle of death and rebirth and the moral economy of karma. 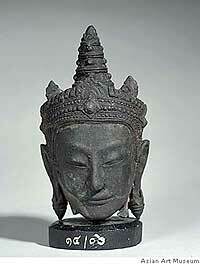 Among the rarities in "The Kingdom of Siam" are several metal heads from a sequence, probably commissioned by a ruler, representing the Buddha in previous lives. From very early on Buddhist tradition included numerous tales recounting the avatar's earlier incarnations and the lessons each implied. The commissioned cycle of sculptures probably included images of all 500 forms -- some animal, some human -- that the Buddha assumed before his birth as an Indian prince who attained enlightenment on Earth. Many little inconsistencies in style and technique among the "jataka" pieces displayed -- named for the "jataka tales" of the Buddha's earlier lives -- suggest that various workshops contributed to the project. Visitors to "The Kingdom of Siam" no sooner get comfortable with Buddhist imagery than they encounter an item such as the superb gilt and mother-of- pearl-inlaid copper "Hindu Deity Harihara" (c. 1500-1600). No one knows what meaning Harihara held for the Siamese, but the elites of Ayutthaya recognized the principal Hindu deities, several of whose attributes identify the four- armed Harihara. The presence of Hindu images among the Buddhist ones in "The Kingdom of Siam" reminds us of the capacity of Asian religions, especially in antiquity, to accommodate each other's beliefs, or iconography. The Hindu-inspired pieces also recall the influence Ayutthaya felt from such neighbors as Angkor (now Cambodia) and India. "The Kingdom of Siam" contains a wide array of other objects besides sculpture, including illustrated manuscripts, textiles, furniture and architectural models. Give the Asian Art Museum credit for providing the American public yet another view of something we perhaps thought we knew. It did the same last year with "Goryeo Dynasty: Korea's Age of Enlightenment" and a decade ago with "Mongolia: The Legacy of Chinggis Khan." "The Kingdom of Siam" leaves a slightly unsatisfying impression of fragmentariness. But given the still-unsolved mysteries of ancient Ayutthaya culture, no accurate account could do otherwise. The Kingdom of Siam: the Art of Central Thailand, 1350-1800: Sculpture, decorativearts, manuscripts and architectural fragments. Through May 8. Asian Art Museum, 200 Larkin St., San Francisco. (415) 581-3500, asianart.org.